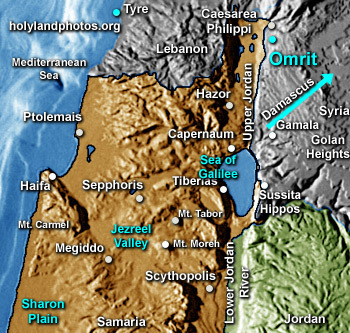 Omrit is a site that was situated in pre–1967 Syrian land but since 1967 it has been in Israeli controlled territory on the western slopes of the Golan—just above the Huleh Valley. It is situated about 2.5 mi. [4 km.] southwest of Banais/Panias (= NT Caesarea Philippi) on the road that led from the Huleh Valley to Damascus. Since 1999 J. Andrew Overman of Macalester College of St. Paul, Minnesota (USA) has been excavating the site. Overman has discovered three successive religious structures—the earliest dating to the Early Roman Period. The first religious structure he calls a "the early shrine." He believes that the first temple was built by Herod the Great to honor his patron—the emperor Caesar Augustus (ruled 28 B.C. to A.D. 14). Many believe that his temple was constructed in nearby "Panias" but Overman argues (I think correctly) that it was here at Omrit—"in the vicinity of Panias"—that it was constructed (see the articles listed below). The second "temple" was probably constructed during the reign of the Roman Emperor Trajian (A.D. 98-117). For an April 12, 2011 preliminary report Click Here. For a 2009 article in the Jerusalem Post Click Here. For the excavation's web site and pictures Click Here. Overman, J. Andrew. "Omrit, Horvat." Pages 1987–89 in The New Encyclopedia of Archaeological Excavations in the Holy Land — vol. 5 — Supplementary Volume. Edited by Ephraim Stern, Ayellet Lewinson–Gilboa, and Joseph Aviram. Jerusalem and Washington, DC: Israel Exploration Society and Biblical Archaeological Society, 2008. Overman, J. Andrew, Jack Olive and Michael Nelson. “Discovering Herod's Shrine to Augustus — Mystery Temple Found at Omrit.” Biblical Archaeology Review 29, no. 2 (March/April, 2003): 40–49, 67–68. Berlin, Andrea M., J. Andrew Overman and Ehud Netzer. “Where Was Herod's Temple to Augustus? — Three Sites Vie for Contention.” Biblical Archaeological Review 29, no. 5 (September/October, 2003): 22–25.